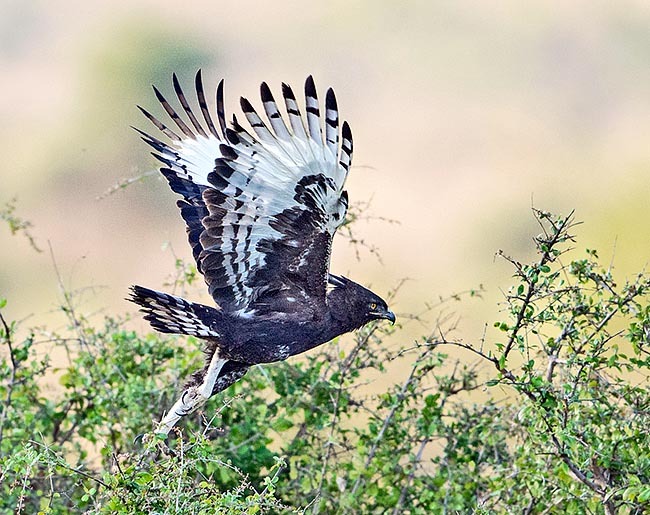 In the English ornithological tradition, the Long-crested eagle, along with the very unusual Bateleur (Terathopius ecaudatus) are the two species of African eagles considered as atypical. They both belong to the order of the Accipitriformes and to the family of the Accipitridae but due to some morphologic and behaviour characterisitcs they are traditionally, even if not totally scientifically supported, kept separate from the real eagles. 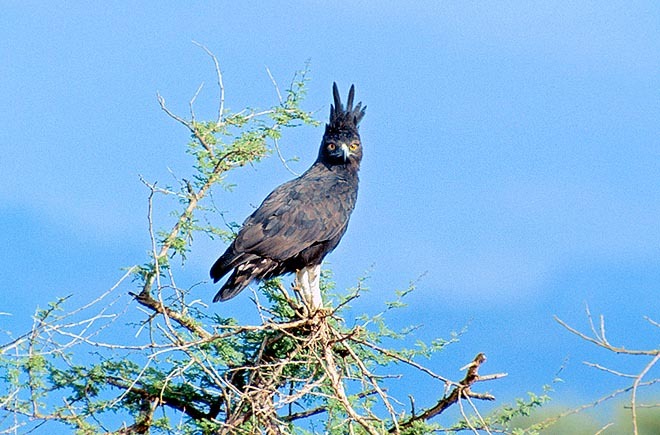 In fact, the long-crested eagle results being the only species placed in the genus Lophaetus (Kaup 1847) and, after recent studies on the DNA, is considered very close to our European spotted eagles (Aquila pomarina and Aquila clanga) and to the Indian spotted eagle (Aquila hastata). 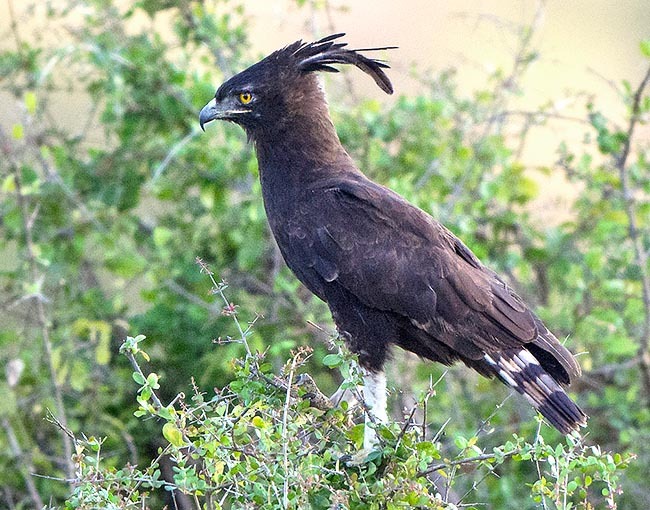 Whilst the bateleur shows particular morphologic characteristica which might give credit to this distinction, the long-crested eagle shows instead all the peculiarities of the eagle even if having reduced size and behaviours often more relevant to those of the buzzards. For these reasons, many would like to have it placed in the genus Aquila and probably in the furure it will get new revisions in its scientific classification. 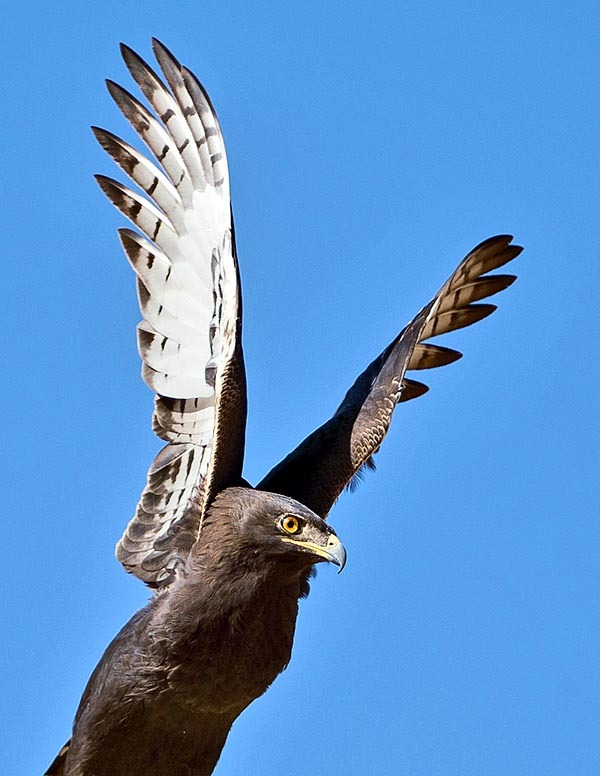 Especially in the flight, it exhibits more agility than the agles with a faster and lighter and less deep flutter and in the meantime loves to behave like the buzzards for what the wait-hunting. It does not practice flying huntings but prefers to perch on branches in positions dominating the small open areas on which it does focuses, patiently waiting for its terrestrial preys. Usually, it stays for some minutes in absolute stillness and then flies a short distance in order to find new locations. 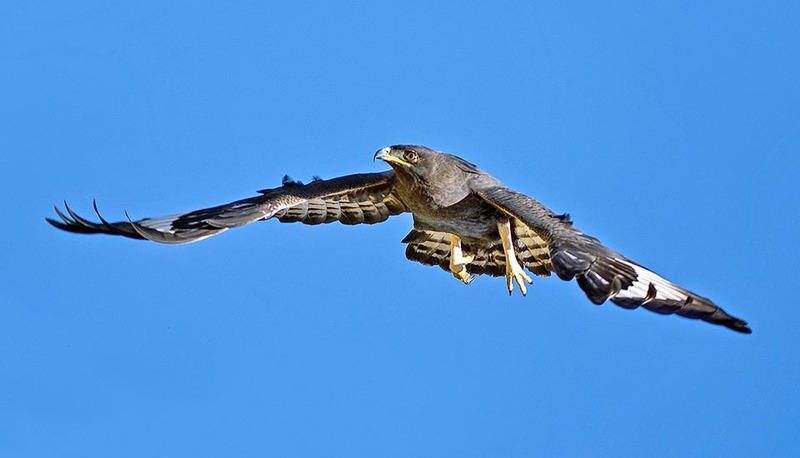 Practically, it spends the day perched and only occasionally performs high altitude flights mostly needed by the necessity of keeping its territory under control. The etymology of the scientific name is extremely clear and exhaustive and always refers to the crest carried by this bird. Lophaetus from the Greek “lophos” = crest and “aetos” = eagle, whilst occipitalis from the same late Latin indicating the position of the head where the same is placed. Occiput being the back part of the head. Also the vulgar names recall this characteristic: in Englis, it’s Long-crested eagle, in French Aigle huppé or Aigle huppard, in Spanish is called Aguila crestilargs, in German is Schopfadler, in Dutch Afrikaanse zwarte kuifarend, in the Zulu language isiPhungumanghathi and in the Xhosa one, Isiphungu-phungu. Uniquely African species occupying the whole sub-Saharan territory. Widely diffused, its fairly scarce in the eastern part of South Africa. It is one of the most frequentraptors in eastern Africa seen the high presence of grassy savannas often absent in the western part of the continent. It is mainly a sedentary bird, even if then, at times, does short seasonal displacements more due to the search for food than to a real migratory necessity. Also the alternation of the dry seasons with the rainy ones may at times lead, especially the young, to perform short excursions in other areas but it seems that these movements are more linked to the research of new territories. It lives from the sea level up to 3000 metres of altitude preferring the warm zones, in scrublands but always close to water streams, while not neglecting in absolute zones thickly wooded interspersed with clearings. It is a bird that is often sighted perched on the poles of power lines, on the bare trees and often even on the roofs of the huts, waiting for some rodents, grass snakes and also big insects. This eagle has no fear at all of the human being and may be approached with extreme facility. Its promiscuity with the human environment often shows it while hunting in the cultivated areas, even if much frequented, seizing even chicks and poultry. Traditionally the local population points out, sometimes unfairly, only the Black kite (Milvus migrans) as author of this misdeed seen the condivision of the same habitat, even if, as said before, this eagle rightly frequents the villages for the greater availability of preys. Like all raptors taking advantage of the anthropic opportunities, also this eagle has begun frequenting assiduously the road routes to avail of the remarkable open spaces and easy to control created by these routes as well as of the facility to find small animals killed by the albeit limited trafic. 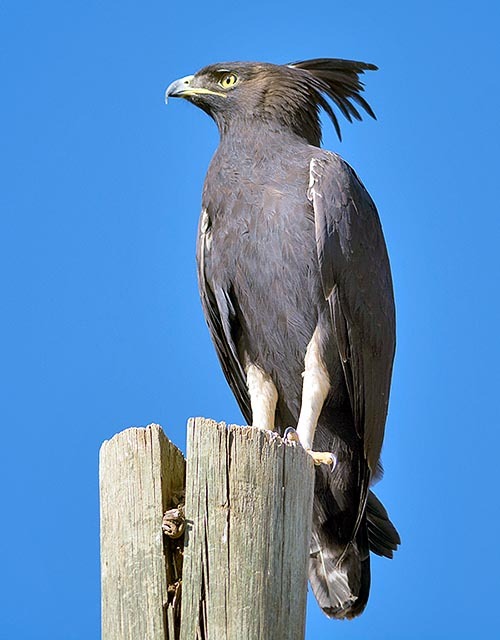 The long-crested eagle is a medium-sized bird reaching the length of 55 cm and a wingspan of 120 cm. The female can reach the 1500 g of weight signicantly exceeding the male’s one that, like all raptors, has a smaller size. The livery of the adult is constant all the year round and is very dark brown tending black in the senior specimens. There is no particolar sexual dimorphism between the sexes apart a small difference in the length of the crest that in the female is markedly reduced. When resting it does not show other colours but the long fluttering tuft that can fold on every side of the head and that often goes down to cover also the front like an unruly lock of hair. Not always visible is the white-striped tail that often it keeps closed and hidden in its resting position. This long crest, easily reaching the length of 10 cm, is almost absent in the young specimens or often is not visible, and therefore there is a certain difficulty in recognizing this species during that period. Dilemma immediately solved when it takes off and shows the wide white spots on the wings and the rather showy striping of the tail. Being a totally dark and blackish bird, it shows while flying an unthinkable contrast with the upper white belt and the lower part of the wings. The young evidence a slightly paler colouration and have the crest of a reduced size, especially the female. The adult has bright eyes of a vivid yellow colour easily visible also from far away due to the contrast creating with the very dark livery whilst those of the young are greyish and little noticeable. The yellowish colouration is acquired progressively while ripening. The legs are yellow with white feathered tarsi. The beak is yellowish with black tip. 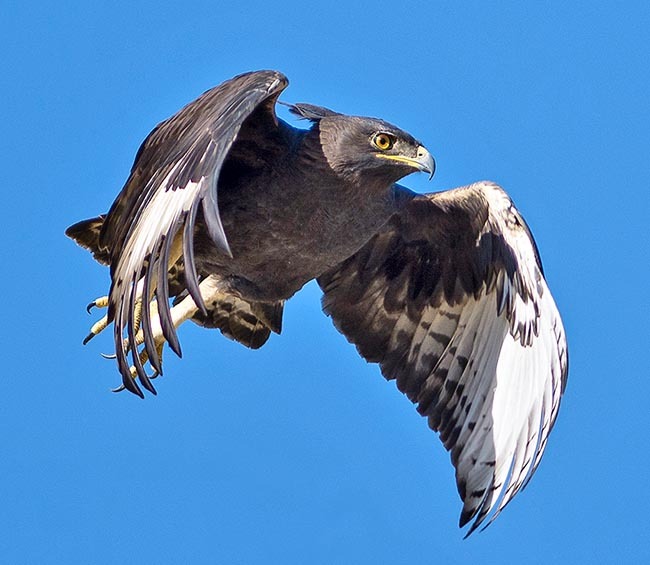 With two analogous raptors, the Black-winged kite (Elanus caeruleus) and the Pygmy falcon (Polihierax semitorquatus), this small eagle shares a dubious distinction on the African territory. They are the raptors most affected by the attack of ticks, especially on the fore part of the head: an attack that slowly causes the impairment, the blindness and the death of the affected subject. This eagle doesn’t have a specific nesting period. It spawns when the alimentary availabilities and the atmospheric conditions are favourable and in different period of the year depending on the occupied area in the vast African continent. It builds a well hidden nest on preferably very high trees, placed on the outer perimetre of woods or forests. Not infrequently also in vast gardens in the inhaboted areas. The nest is fairly big and resistant seen the usual placing on the higher branches of the tree. Nests placed at more than 40 m from the ground have been sighted. It can be more than 80 cm long and even 30 cm deep. It is a nest carefully prepared on a base of robust branches, well intertwined and covered inside by soft leaves which are continuously carried to the nest also during the hatching. This eagle lays 1 to 2 eggs that are brooded for about 40/45 days. During this period it is a fairly vociferous eagle and the pair emits continuously strong alarm cries every time it is busy in defending the territory from the attacks or overflights of other birds. The young remain in the nest for about two months, especially the second-born who usually comes to life two weeks after the first. The typical and pronounced fratricide of the eagle has not been ascertained, perhaps due to the fact that having the whole year available for the spawning, this eagle may be able to choose the best periods when the preys abound. It is estimated that the total population of this bird may amount to 100.000 individuals. It is therefore considered as not endangered but is closely monitored as it has been noted that the reduction of their habitats has resulted in the time in slight decrement in their overall number. Falco occipitalis Daudin, 1800; Spizaetus occipitalis Daudin, 1800.